Internal string lights make Slimer "glow"
Inflates in under 2 minutes! Okay, let's see. Candy dish, full of treats? Check. Spooky flashing decorative lights? Check. Scary monster displays and haunted house noises playing in the background? Check and check! A Class 5 Full Roaming Vapor, tearing apart the snack table and chasing the dog around the yard? Ummmm that wasn't in the party plan... But, the guests and trick-or-treaters are going to be start arriving any moment! Who are we gonna call?? Actually, that spooky specter is just a Ghostbusters Slimer Inflatable decoration. Even though he's an ugly little spud, he is still kind of cute, and doesn't seem to be hurting anything. So, maybe he won't be such a bad party guest, after all. 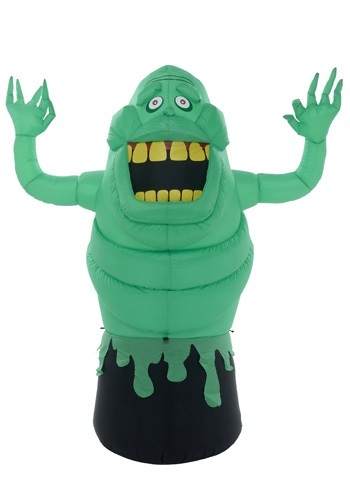 This Slimer decoration just needs is to be plugged into a wall outlet, and he automatically inflates. Once he's inflated, he'll be ready to shine under your creepy lights and any other ghostly decorations you've set up. With this fun Ghostbusters themed decoration, you'll show everyone you ain't afraid of no ghost!